(Francisco Kjolseth | The Salt Lake Tribune) Utah Navajo Dine Bikeyah members Albert Holiday, Leonard Lee and Jonah Yellowman, from left, gather at the Utah Capitol after sitting in on Rep. Mike Noel's, R-Kanab, proposed HB136 that would muzzle city and local officials from speaking out on public-lands protections during the House Natural Resources, Agriculture, and Environment Standing Committee at the Capitol on Tuesday, Feb. 6, 2018. (Francisco Kjolseth | The Salt Lake Tribune) Utah Navajo Dine Bikeyah member Willie Grayeyes speaks in opposition to HB136, sponsored by Rep. Mike Noel, R-Kanab, at left, which muzzles city and local officials from speaking out on public-lands protections during the House Natural Resources, Agriculture, and Environment Standing Committee at the Capitol on Tuesday, Feb. 6, 2018. (Francisco Kjolseth | The Salt Lake Tribune) Rep. Mike Noel, R-Kanab, proposes HB136 to muzzle city and local officials from speaking out on public-lands protections during the House Natural Resources, Agriculture, and Environment Standing Committee at the Capitol on Tuesday, Feb. 6, 2018. (Francisco Kjolseth | The Salt Lake Tribune) Rep. Mike Noel, R-Kanab, proposes HB136 to muzzle city and local officials from speaking out on public-lands protections during the House Natural Resources, Agriculture, and Environment Standing Committee at the Capitol on Tuesday, Feb. 6, 2018. Lined up behind him in opposition to the bill are members of the Utah Navajo Dine Bikeyah. (Francisco Kjolseth | The Salt Lake Tribune) Utah Navajo Dine Bikeyah member Willie Grayeyes is asked to swear in before his testimony in opposition to HB136, sponsored by Rep. Mike Noel, R-Kanab, at left, which muzzles city and local officials from speaking out on public-lands protections during the House Natural Resources, Agriculture, and Environment Standing Committee at the Capitol on Tuesday, Feb. 6, 2018. A bill aimed at regulating how city and other government officials in Utah advocate for federal protections of public lands got its first hearing on Capitol Hill Tuesday and is moving ahead. As first drafted, HB136 sought to bar those officials from publicly supporting land protections, but the measure was amended Tuesday to instead require them to consult the Legislature’s Natural Resources, Agriculture and Environment Interim Committee for feedback before proceeding. If it passes, some warn the measure could hamper the Mountain Accord, aimed at resolving long-standing land-use controversy on the Wasatch Front. But bill sponsor Rep. Mike Noel, R-Kanab, contends the state should oversee lobbying by local officials and agencies — including universities — when it comes to national monument and other designations by the U.S. government. Viewed by environmentalists as another legislative attack on Utah’s public lands, the latest version of HB136 would cover officials from all the state’s political subdivisions, preventing those who “intend to advocate for“ federal land protections from doing so without going to the Legislature first — but not those who oppose them. “It’s a transparency bill. It brings full light to an issue,” Noel told the House Natural Resources committee Tuesday. After a late-stage substitution of some of HB136’s key language, the measure advanced to the full House, with Rep. Joel Briscoe, D-Salt Lake City, casting the only nay vote. The bill’s first committee hearing was rife with tension, some of it growing out of Utah’s recent public-lands battles over national monuments. Chair Keven Stratton, R-Orem, insisted on swearing in those offering comment and warned that they would be guilty of a felony if they made a false statement. (Francisco Kjolseth | The Salt Lake Tribune) Utah Rep. Mike Noel, R-Kanab, is sponsoring HB136 which would restrict city and local officials from speaking in favor of federal public-lands protections. The measure got its first hearing Tuesday during the House Natural Resources, Agriculture, and Environment Standing Committee on Capitol Hill. The rare swearing-in, which insinuated that bill’s opponents would try to deceive the committee, drew a rebuke from Rep. Susan Duckworth, D-Salt Lake City, who wound up voting for the bill. “It is an intimating question. It’s harassment,” said Duckworth, adding she has never seen speakers at a legislative hearing be asked to swear an oath. Stratton said the oath was necessary to “protect the integrity of the process,” suggesting people speaking before his committee have been less than truthful. Ultimately no environmentalists testified Tuesday. 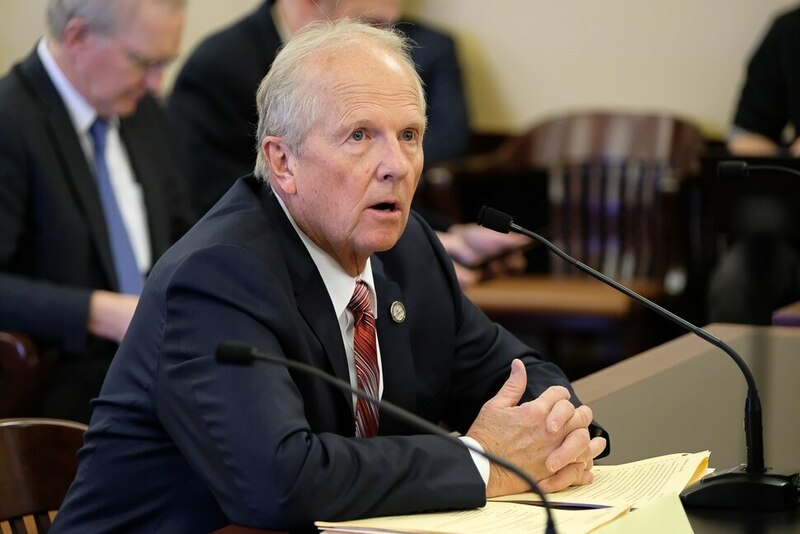 The Utah League of Cities and Towns and Utah Association of Counties had reservations about the original version of the bill, which required cities and counties to convince the Legislature to pass a supportive resolution before they may advocate for a particular designation. But lobbyists for those groups said those concerns would likely be resolved in a substitute version dropping that requirement. 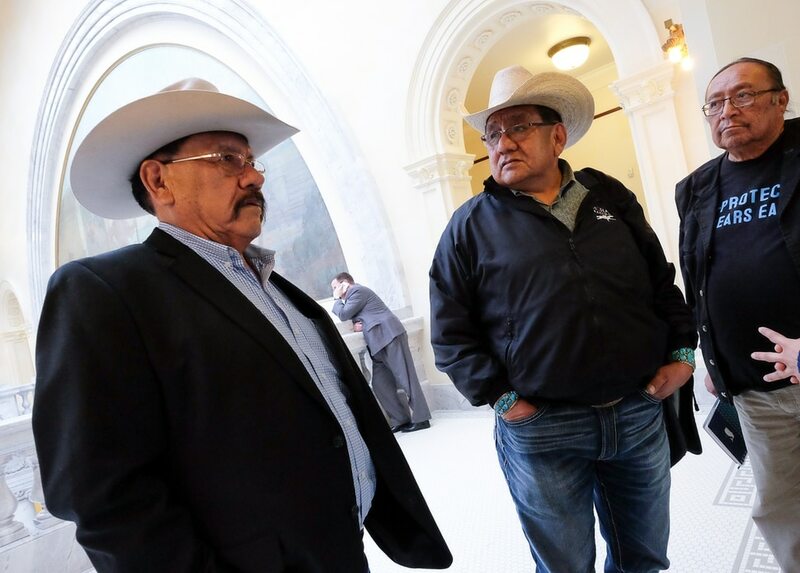 Utah Dine Bikeyah chairman Willie Grayeyes, a leading proponent of the Bears Ears National Monument, was the only witness to speak against the bill. Noel responded to Grayeyes, a Navajo who is among Noel’s constituents, by claiming his group is funded by the environmental groups Grand Canyon Trust and Southern Utah Wilderness Alliance. It was not the first time he made such a claim, which Utah Dine Bikeyah says is false. 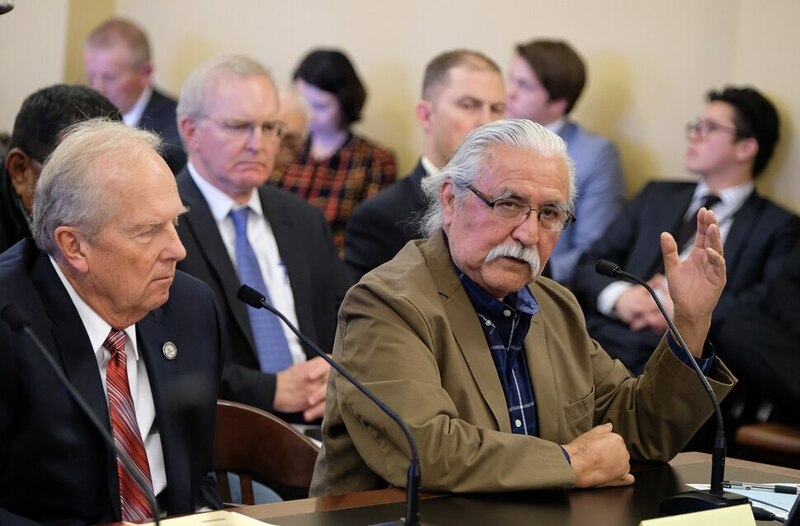 (Francisco Kjolseth | The Salt Lake Tribune) Utah Navajo Dine Bikeyah member Willie Grayeyes speaks in opposition to HB136, sponsored by Rep. Mike Noel, R-Kanab, at left, which would limit how city and local officials might speak out in favor of federal public-lands protections. The measure got its first hearing Tuesday during the House Natural Resources, Agriculture, and Environment Standing Committee on Capitol Hill. Gavin Noyes, its executive director, tried to rebut Noel’s claim, but was denied a chance to speak at the hearing. The Bears Ears and Grand Staircase monuments in southern Utah were the two main cases Noel cited where land designations harmed the state’s interests, complaining that national monument status had held up a needed transmission line to Cedar Mountain in his district. His bill also would apply to lobbying with regard to other federal land designations, including national conservation area; wilderness area or wilderness study area; area of critical environmental concern; research natural area; and national recreation area. Noel’s measure exempts the Utah School and Institutional Trust Lands Administration, after that agency raised concerns that the lobbying restrictions would complicate its efforts to trade its holdings for federal lands that might be easier to develop. The bill also raised questions about other public-lands lobbying. Noel, for example, has strongly favored directing appropriations to private groups fighting monuments and other forms of federal oversight that impede multiple use of public lands. He emphasized Tuesday that he does not oppose taking care of public lands, but rather to federal designations that thwart logging, grazing and other land uses that could enhance watersheds and wildlife habitat and reduce fire threats. Noel claimed wilderness designations, such as the 80,000 acres he said for Utah Congressman Jason Chaffetz once proposed for the Wasatch, would make forest thinning impossible. “You can’t do anything that would protect the watershed,” Noel said. That characterization of the failed 2016 Chaffetz bill is false, said Carl Fisher of Save Our Canyons, which advocates for conservation of lands in the Wasatch Mountains. The Central Wasatch National Conservation and Recreation Area Act would have created and 80,000-acre conservation zone outside Salt Lake City, but it would have added only 6,158 acres of wilderness around Mount Aire and Grandeur Peak. The measure’s key purpose was to safeguard municipal water sources and enhance recreation and access.